Why not send a Cornish Valentine’s treat to your loved one this February 14th? From Cornish chocolate and sparkling wine, to cream teas and full Cornish breakfast hampers we have something for him and for her that is sure to delight! We can send your parcel to that special someone whether they live locally or anywhere in the UK. 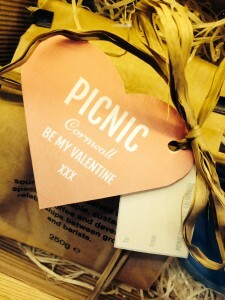 If you would like our help in putting a bespoke hamper together just drop us an email to info@picniccornwall.co.uk or give us a call – it will be our pleasure to help! Click here to visit our Valentines Hamper Shop!